Vietnam has extended the list of countries qualifying for e-visas by 34 to 80 and extended the scheme to January 31, 2021. The new countries include major source markets in Europe. Despite likely hurdles, export of marine products is expected to rise by 17 per cent to US$3.5 billion this year, according to the Việt Nam Association of Seafood Exporters and Producers (Vasep). Many countries are banning pork imports from Vietnam following the recent outbreaks of African swine fever in the country. The prices of oil and petrol have climbed nearly VNĐ1,000 (US$0.043) per litre folowing the latest adjustment by Ministry of Finance and the Ministry of Industry and Trade on Saturday. 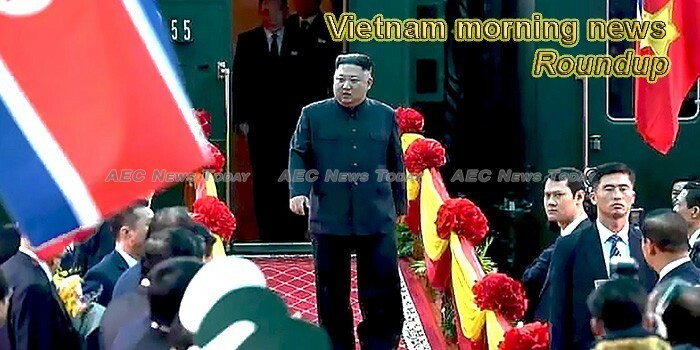 While addressing a joint Press Conference at Hanoi, after his summit, with North Korean Leader Kim Jong Un, US President, Donald Trump spoke not just about the Summit, but also the current state of US-China relations. Trump criticized his predecessors, for not doing enough to address the trade imbalance with China, while also making the point, that he was all for China’s economic progress and growth, but not at the cost of the US. The maximum fare on Hanoi’s first metro line will be VND15,000 (65 cents), city authorities said in a draft proposal. Japan’s Taisho wants control of the DHG Pharmaceutical Company by raising its stake to 56.69 percent from 35 percent. Will Vietnamese e-Commerce competitions still have enough vacancy for new warriors? In addition to the bright and prominent names such as Shopee, Tiki, Lazada, Sendo, Thegioididong, Adayroi, etc. There are also many brands that have to withdraw from this war like Beyeu.com, Deca, Foodpanda, Lingo, etc or most recently Vui Vui (vuivui.com) of the Mobile World was officially closed from the end of November 2018. The national industrial production index (IIP) in February was estimated to decrease by 16.8 per cent over the previous month due to the Lunar New Year holiday, according to the General Statistics Office (GSO). Disbursement of public investment was low in the first two months of this year partly due to the impacts of the nine-day Tết holiday, according to a Ministry of Finance report. The State Bank of Việt Nam (SBV) has urged credit institutions to ensure adequate funds to meet the capital demands of rice exporters for the winter-spring crop this year. The shortage of qualified pilots is getting more serious in Vietnam as more air carriers receive licenses to operate in the country. Việt Nam is in the early stages of developing renewable energy sources and needed to introduce more incentive policies to attract more investment, experts have said. Registration fees for pickup trucks and vans will be raised to 6 per cent of the vehicles value from the current rate of 2 per cent from April 10, according to a revised Government decree. The northern province of Phu Tho plans to spend 118 billion VND (more than 5 million USD) on developing the tea sector to improve the productivity and quality of local tea products. Many market experts and securities companies agree that the imposition of the new derivative fees help regulate and select cash flow in the underlying stock market. Economists and scientists gathered at a meeting chaired by Prime Minister Nguyen Xuan Phuc in Ha Noi on Saturday to work on documents for socio-economic development strategies to be submitted to the 13th National Party Congress. The HCM City Real Estate Association has proposed social housing lending rates be lowered to 3-3.5 per year to create favourable conditions for low-income earners to afford homes. The HCM City Real Estate Association has proposed social housing lending rates to be lowered to 3-3.5 per year to create favourable conditions for low-income earners to afford homes. Japan retained the number one spot in the 2018 foreign investors’ list in Vietnam, routing Korea for two consecutive years, data showed Sunday. Economic experts and scientists gathered at a meeting chaired by Prime Minister Nguy Xuân Phúc in Hà Nội Saturday to work on documents on socio-economic development strategies to be summited to the 13th National Party Congress. Bao Hoai Nam, founder of Lavender Flower and Peony Home, will be the first and only Vietnamese artist joining the FTDWorldcup 2019, a top interfloral designer competition.